[Q&A] Korea Rhinoplasty #3 - 짱이뻐! 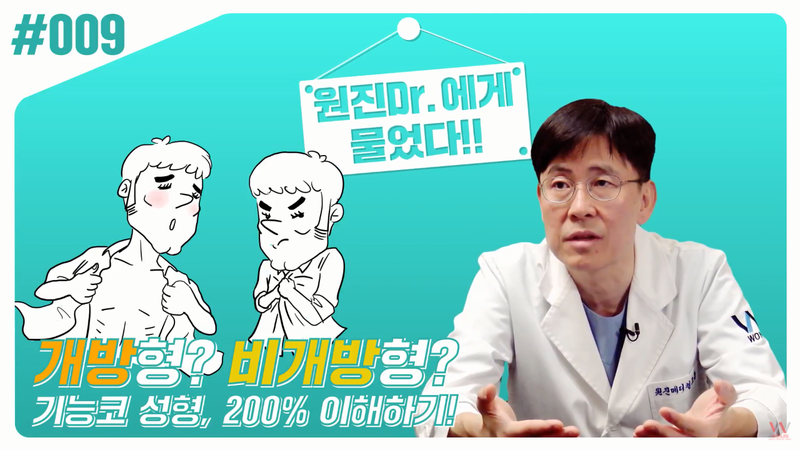 It's been explained in the first two posts about Korea rhinoplasty. Now the question is, can both aesthetic and functional nose surgery be done at the same time? Or we have to do it one by one so we'll get two surgeries at the end? As stated before, the functional problem inside the nose will be solved by the doctors of ENT (Ears, Nose, Throat) while the aesthetic problem will be handled by the plastic surgeon. The second one can be done right after the first one is done. So in one surgery, you'll be able to solve both problem. There are two methods of Korea rhinoplasty, Open Incision and Close Incision. So, among those two, which one is the best? Again, if we compare it as a house, it's like we're repairing the wall inside the house. As for Open Incision for Korea rhinoplasty, it's like we open the roof so we can take a look inside the house. Well, of course we don't always need to open the roof to see what's inside the house right? We can see it through windows. It's just like the Close Incision for Korea rhinoplasty. Though, ENT doctors mostly do Close Incision instead of Open Incision. But then if it's a collaboration surgery with the aesthetic one, then both ENT doctors and plastic surgeons usually do Open Incision. Using Open Incision, the sight is clearer that can make better surgery result. But again, if the patient prefers Close Incision, of course it's also possible to be done.